If you wear brainwashed would you even know it? You have to remember that they bad mouth President Obama more in two hours than they bad mouthed Bush in 12 years. 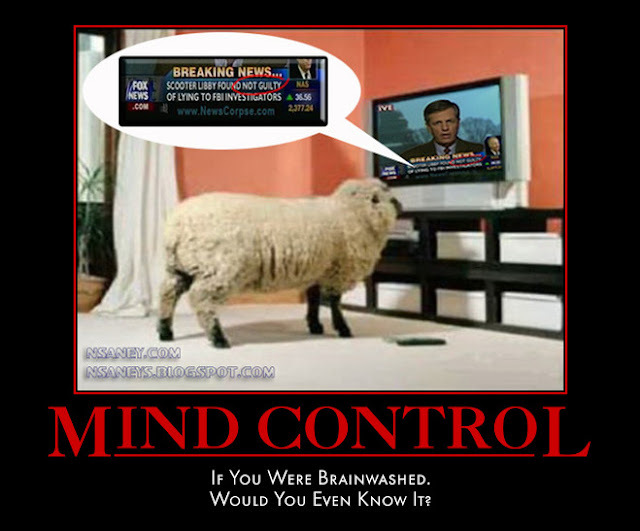 These people that watch Fox "News" have been subjected to a propaganda machine that runs 24 hours a day, 7 days a week, 365 days a year, year in and year out. They seriously have no clue they have been brainwashed. This is a picture of Tea Party "patriots" marching for the Koch brothers to support their billionaire agenda. They are dresses in red white and blue United States of America flag clothing. Which I believe is against the flag code. Seriously? Every other news network tell lies while Fox News tells the truth. I am positive Fox News tell more lies than all the others combined. There is not doubt in my mind on the matter. One of the other signs reads: Our government needs an enema! Now this sign a fully agree with. Although the enema would flush out everyone she voted for I assure you.